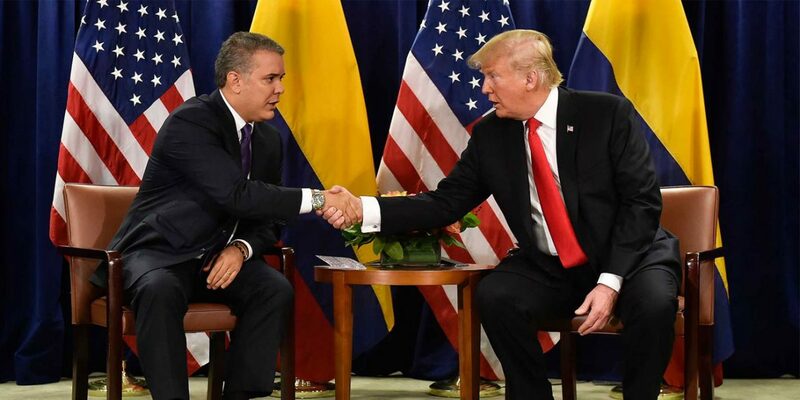 United States President Donald Trump clashed with his Colombian counterpart Ivan Duque for the second time in a month over failures in the countries’ counternarcotics efforts. While at an event in Texas, Trump said that Colombia’s drug trade expanded 50% since Duque took office in August last year. “Unfortunately their drug business has gone up 50% since he’s been there,” Trump said while criticizing Latin American countries including Colombia for “sending their criminals” to the US. Duque defended his government’s drug policy at a public event in port city Cartagena where he repeated three times that “we are accountable to the Colombian people” without explicitly referring to Trump. The Colombian president additionally urged the international community to tackle a global increase in the consumption of drugs, stressing Colombia’s sacrifices since the surge of Colombian cocaine production and trading in the 1970s. This phenomenon must be assumed by all countries. This is why the conventions of the 70s sought to curb this scourge with a clear sense of morality, on the one hand to confront supply and on the other demand. Colombian and US authorities have been trying to curb drug trafficking for decades, and have been confronted with the biggest ever surge in cocaine production since 2013. The bilateral attempts to curb the cultivation of coca, the base ingredient for cocaine, using forced eradication and aerial fumigation was set back even further in 2015 when Colombia’s constitutional court banned the use of the glyphosate, which scientists believe could cause cancer. A UN-led project to curb coca cultivation through rural development and crop substitution, which is widely believed to be more efficient, has been opposed by both governments. There have been indications that this crop substitution program is also failing because of underfunding and the government’s failure to effectively assume control over Colombia’s countryside.